PAINWeek 2019 offers a multidisciplinary faculty and diverse curriculum in the following course concentrations: behavioral, functional, integrative, and interventional pain management, health coaching, medical/legal issues, neurology, pain and chemical dependency, physical therapy, palliative care, pharmacotherapy, and wound care. There will also be full-day programs presented by the American Pain Society, the American Society of Pain Educators, and the International Pelvic Pain Society. 120+ credit hours are available for physicians, physician assistants, nurse practitioners, nurses, pharmacists, hospitalists, psychologists, and social workers. The number of credits will be determined in August. To jump to a specific section, click the header you want below. While at PAINWeek, plan on spending a night exploring the City of Entertainment for world class dining options and memorable shows. The 2019 conference will be located right on the Las Vegas Strip with easy access to all Vegas has to offer. Register here if you are a practicing healthcare professional, resident, or student. This information will be verified by PAINWeek staff prior to confirmation of your registration. Optional workshops for PAINWeek 2019 will have additional costs and may be added during registration. Register here if you are affiliated with a pharmaceutical company; device manufacturer; medical, healthcare education, or communications company; screening lab; or other PAINWeek sponsor or exhibitor. DO NOT register as a practicing healthcare professional, resident, or student. This information will be verified by PAINWeek staff prior to confirmation of your registration. The annual conference presents 120+ hours of continuing medical education courses and master classes, special interest sessions, and satellite events geared toward physicians, physician assistants, nurse practitioners, nurses, pharmacists, hospitalists, psychologists, and other healthcare professionals involved in pain management. Read, watch, and listen to PAINWeek faculty. We'll post the PAINWeek 2019 schedule closer to the conference! PAINWeek 2018 had a contracted a special room rate of $165 per night, plus tax, for healthcare providers. You can book your room once the room block has opened. Your room will be either a City Room or a Terrace Studio, at the discretion of the resort. A selection of room upgrades at discounted pricing is also available exclusively for registered PAINWeek attendees. We will list the 2019 rate once the the room block has opened. The PAINWeek room block usually opens in late spring or early summer. Click here to view the PAINWeek 2019 conference preview. If you are a clinical, legal, or public policy expert who strives to make most moments teachable, then heed our Call for Presentations. Submit your presentation proposal for PAINWeek 2019. All submissions are due by 5p EST, Friday, February 1. The abstract submission system is now open! PAINWeek invites you to submit abstracts for posters to be presented at the PAINWeek 2019 National Conference. Deadline for submission is 5:00pm EST, Friday, July 26, 2019. 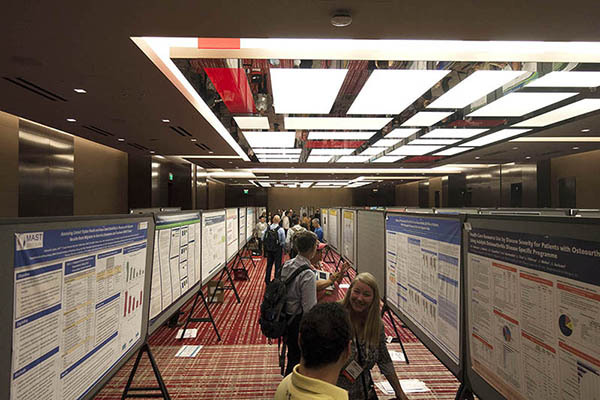 Plan now to have your poster included at PAINWeek 2019! The abstract submission system will officially open in Spring. Please review the guidelines below. Scientific Session Chair, Joseph V. Pergolizzi, MD, and Co-chair, Srinivas Nalamachu, MD, invite you to submit abstracts for posters to be presented at the 2019 PAINWeek National Conference. More than 2000 attendees from across the country are gathering to foster solutions to the problem of inadequate pain control. 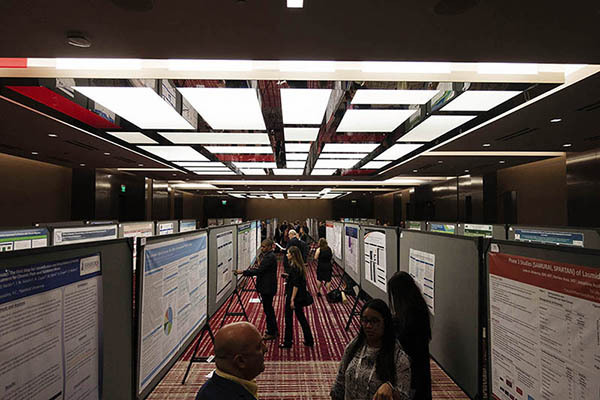 To enrich the attendee experience, we offer poster sessions to share the latest information from current research and clinical findings with our attendees. Abstracts may be research oriented or evidence based that are relevant to frontline practitioners who treat patients in pain. The deadline for electronic submission is 5:00pm EST, Friday, July 26, 2019. All authors will be notified via email on or by August 16, 2019. Presenting author(s) or presenter(s) of accepted abstracts must register at the current registration rate to attend the PAINWeek National Conference. Submission of an abstract does not automatically register you for the conference. Abstracts may be of original research or encore (repeat) presentations of abstracts, ie, PAINWeek will accept abstracts that have already been presented at other medical conferences. List affiliations for all authors, such as universities and other institutions. 5. List names of all authors, in the order in which you wish them to appear in printed text. One listed author must attend PAINWeek to present. List disclosures (financial and/or in-kind support). If none, state “Nothing to disclose by any author(s)”. Please indicate whether you are interested in being considered to present orally. Do not use tables, charts, or graphs in your abstract submission (they can be included in the actual poster). There is no limit to the number of abstracts one author may submit for consideration. The first author is responsible for communicating all these policies to all involved parties. Student authors are permitted to submit. PAINWeek requires faculty and poster authors/presenters who have an interest in selling a technology, program, product, and/or service to healthcare professionals to disclose this information in order to be considered for and/or present at any PAINWeek educational session. If your abstract is accepted, you will be notified on or by August 16, and the abstract will be posted online by August 27. Only accepted abstracts will be posted online. Posters will not be published online. After acceptance, format your abstract into a poster which may include graphs, tables, and charts. Maximum poster size is 42" high x 90" wide. Authors/presenters should bring their posters with them to the conference. Please do not send posters to the PAINWeek offices or in care of PAINWeek. Detailed instructions will accompany acceptance notices. While first authors typically attend the conference in person, PAINWeek allows other listed authors to attend in his/her place. Recording by any means (photographing, audiotaping, videotaping) of any presentation/session is prohibited, except by a PAINWeek authorized agent or by first author(s) who wish to photograph their own poster presentation. Violators risk confiscation of their equipment and/or dismissal from PAINWeek. QR codes with a maximum size of 1" by 1" are permitted in the lower corner of posters. Scanning of a QR code only by participants using smart phones or other mobile devices is permissible. Interactive content/features on printed posters that can be viewed using smartphones or iPads is allowed (for example, additional graphs, animations, videos related to the printed poster content). Presenters may use an iPad or tablet to facilitate their presentation, but it cannot be using in lieu of a printed poster. Tablets may also be available for viewers to see the interactive content during the poster presentation time. Supplementary information on how to download relevant QR codes and access interactive content may be included on the poster, ie, within the text of the poster or printed on the bottom. Authors should arrive on site to have their posters up by 3:00p on Wednesday, September 4 (Day 2 of the conference). PAINWeek will provide a poster board, pushpins, and poster number. If you would like to provide reprints of your posters (ie, handouts) you may leave them under your assigned poster board. Posters will be available for public viewing after 3:30p. The poster session room will be closed at 5:30p for the Keynote and Welcome Reception and will reopen on Thursday at 8a. Due to the enormity of requests for posters to have longer onsite accessibility, we ask that all posters be set-up by 3:00p on Wednesday, September 4. 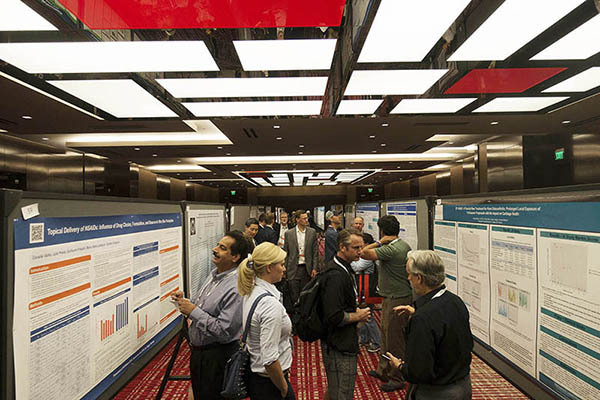 All authors and/or presenters should be available at their posters for the Scientific Session reception, which will be held on Thursday, September 5, 6:30p-8:30p. PAINWeek name badges will be required for entry. Refreshments will be served. The review committee will choose 6 abstracts (posters) for oral presentations at the PAINWeek National Conference. Presenters will be notified by August 24. Date, time, and location of oral presentations will be announced. While first authors typically present in person, PAINWeek allows other listed authors to present in his/her place. The PAINWeek late-breaking abstracts policy allows for the submission of late-breaking abstracts only for randomized phase III trials for which no preliminary data are available at the time of the abstract submission deadline (July 26), but for which a preplanned analysis of the primary endpoint is scheduled after that date but before August 16 (deadline for the final, updated late-breaking abstract). During abstract submission, you will be required to provide the date of planned analysis. The policy is not a mechanism to allow for updated data to be submitted later when preliminary data are available by the abstract submission deadline. The abstract submission system is now open! The abstract submission system will close at 5:00p EST, July 26, 2019. Click here to submit your abstract. Certified credit for physicians, nurses, pharmacists and more! The educational design of this activity addresses the needs of physicians, physician assistants, nurse practitioners, nurses, pharmacists, psychologists, and social workers involved in the treatment of patients with pain. PAINWeek® provides practical knowledge and tools for busy pain management practitioners to utilize in their daily practice. Over 120 hours of content will be presented! For full learning objectives, please visit m.painweek.org. Global Education Group designates this live activity for a maximum of 39.0 AMA PRA Category 1 Credits™. Physicians should claim only the credit commensurate with the extent of their participation in the activity. Global Education Group designates this continuing education activity for 39.75 contact hours (3.975 CEUs) of the Accreditation Council for Pharmacy Education. Please see m.painweek.org for full ACPE information and UAN numbers. Please note: Pharmacy learners will not be eligible to receive partial credit. Individual courses must be attended in their entirety in order to be eligible to receive credit for those 1.0 or 2.0 credit hour sessions. Instructions for Credit—In order to receive credit, pharmacist participants must attend an entire course and complete the online credit application and evaluation form. An NABP number and date of birth (DOB) will be required to complete these forms and earn credit. Please bring this information with you to the conference for use while completing your evaluations. Global Education Group is accredited as a provider of continuing nursing education by the American Nurses Credentialing Center’s COA. This educational activity for 39.75 contact hours is provided by Global Education Group. Nurses should claim only the credit commensurate with the extent of their participation in the activity. Global Education Group (Global) is approved by the American Psychological Association (APA) to sponsor continuing education for psychologists. Global maintains responsibility for this program and its content. This activity has been approved for a maximum of 39.0 CE credits for psychologists. The instructional level of this activity is introductory. Psychologists should only claim credit commensurate with the extent of their participation in the activity. Please note: Attendance of psychology learners will be monitored. As with all conference participants, psychology learners will be required to scan in using their coded badge. Psychology learners must then formally sign out for each session in which they are applying for continuing education credit. Global Education Group is accredited by the American Association of Nurse Practitioners as an approved provider of nurse practitioner continuing education. Provider number: 1561024. This activity is approved for 39.05 contact hour(s) which includes pharmacology hours (25.80). The AAPA accepts AMA PRA Category 1 Credit™ from organizations accredited by the ACCME. This program is Approved by the National Association of Social Workers (Approval # 886551415-1846) for 33 continuing education contact hours. This program is Approved by ACEND (Approved Provider Identification Number – ACE1844-01) for 0.4 CEUs. In order to receive credit, participants must attend the course and complete the online credit application and evaluation form. These forms are available to complete at http://www.painweek.org/evals. Participants can only claim the hours they were actually in attendance for CME credit. Statements of credit are available to print upon completion of online forms. Please note that registration fees apply to this conference. Supported in part by an educational grant from Daiichi Sankyo, Inc.; Biogen Idec, Inc.; Amgen; Jazz Pharmaceuticals; Supernus; Flexion Therapeutics; and St. Jude/Abbott. Event staff will be glad to assist you with any special needs (physical, dietary, etc). Secure a special room rate at The Cosmopolitan of Las Vegas. We will list the 2019 rate once the the room block has opened. PAINWeek has contracted a special room rate of $165 per night, plus tax, for healthcare providers. You can book your room once the room block has opened. We will list the 2019 rate once the the room block has opened. The PAINWeek room block usually opens in late spring or early summer. Your room will be either a City Room or a Terrace Studio, at the discretion of the resort. This year at PAINWeek, we can also offer you the option of extending your stay for up to 3 days before and/or after the conference proceedings for the same preferred per-night room rate. This resort fee is optional for PAINWeek attendees who book accommodations concurrently with conference registration. We look forward to seeing you at PAINWeek! Nevada lodging sales tax is currently 12%. Please be cautious about third-party housing vendors that claim to be working with PAINWeek, and advertising very low rates. This also includes housing sites that are using our logo to mispresent themselves. They do not represent PAINWeek and are scams. Please do not provide any credit card information to these entities. Please only trust emails from painweek.org or cosmopolitanoflasvegas.com. If in doubt, please email or call us. We take your personal information very seriously. We do not sell our lists to any entity. We are actively engaging with legal counsel to best determine our course of action in this matter in order to stop these organizations from confusing our registrants. We apologize for any inconvenience or confusion these emails may have caused you and we look forward to seeing you at PAINWeek. This section is designed to provide assistance in explaining the value of PAINWeek to your employer, to secure consent for your participation. At PAINWeek, you can custom design a learning experience of up to 36.0 CE/CME credit hours from the most comprehensive pain education curriculum offered anywhere: in 2017, we presented over 120 hours of continuing education and informational programs across some 18 different course concentrations. PAINWeek now enjoys the collaborative support of 22 professional and patient advocacy groups, including the American Pain Society, the American Academy of Pain Medicine, and the Veterans Health Administration. This curriculum is further augmented by a full complement of satellite symposia, product theatres, interactive activities, and the PAINWeek exhibit hall. Here are some specific considerations that can affirm the value of your participation in PAINWeek. What will you bring back? For a nominal additional fee, attendees may purchase the Online Content Package (slides and synced audio) covering the entire PAINWeek curriculum. * This is of great value to you, as a means to experience concurrent course sessions that you are unable to attend onsite. How much CE/CME credit can you earn? Depending on your specialty, you can earn up to 36.0 CE/CME credit hours at PAINWeek (even more if you additionally attend certified satellite events). With access to the most comprehensive curriculum of any pain conference, your 4 day investment is among the most cost effective approaches to earning certified credit. If your hospital has or is trying to obtain magnet status, remind your supervisor that demonstrating staff participation in continuing education is vital to securing and keeping magnet status. Who will cover for you? Here are some commonly used tools for calculating and presenting the return on investment of your participation in PAINWeek. To be most persuasive in justifying your attendance, you should focus on the intersection between your/your organization’s knowledge requirements and the PAINWeek agenda opportunities. Refer to the conference agenda and design a personal curriculum that maximizes this intersection. If you are new to PAINWeek, the suggested PAINWeek 101 agenda may help. By presenting these aggregated benefits against a solid estimate of expenses, you can provide your management with the assurance of demonstrated value--to you, and to the organization as a whole. The following sample letter can be adapted and used to convey your presentation. Attending the PAINWeek 2018 National Conference will enhance my knowledge and skills, which will enable me to provide better care for my patients. I hope to pass on much of what I learn to my colleagues, and my notes and copies of the speaker presentations will be available for reference. Thank for your consideration of this request. *This session is not certified for credit. Click here to download the PAINWeek 101 guide. Click here to read Dwayne's essay. PAINWeek is the nation's largest pain conference for frontline clinicians with an interest in pain management. Convening at The Cosmopolitan of Las Vegas on September 4-8, more than 2,200 physicians, physician assistants, nurse practitioners, nurses, pharmacists, hospitalists, dentists, psychologists, and social workers are expected to attend. There will be 120+ hours of continuing medical education courses and master classes, special interest sessions, and satellite events. We will award 10 scholarships that cover the cost of registration, and one grand prize winner will receive 5 nights of hotel accommodations at The Cosmopolitan of Las Vegas in addition to complementary conference registration. Essays must be written in a Word document, be no more than 2,000 words, and must be emailed to info@painweek.org. The subject line should be “scholarship”. Scholarship winners* will be selected by PAINWeek and notified via email and/or phone no later than July 27, 2018. *Paid individuals who already registered for PAINWeek and subsequently designated as winners will have their full conference registration fees refunded. If you pre-paid for PAINWeek OnDemand, that fee is not included and will not be refunded should you win a scholarship. Why should primary care clinicians learn more about pain management? Pain is the #1 reason for an office visit to a primary care clinician. Over 116 million Americans suffer from persistent chronic pain. Many clinicians also admit that their training and education did not prepare them well for pain management. PAINWeek believes that primary care clinicians are on the frontline of this major public health issue and are the ones expected to reduce the burden of suffering and provide a better quality of life for chronic pain patients. PAINWeek attendees come from all medical specialties. One of the significant benefits of participation, according to our surveys, is the opportunity to interact with colleagues of varying backgrounds and perspectives. If you are a primary care clinician, you are a frontline practitioner, and you should attend PAINWeek. This includes primary care physicians, physician assistants, nurse practitioners, pharmacists, psychologists, and those in other medical specialties. With only 4,000 pain specialists in active practice nationwide, there are simply not enough to go around. The burden of care for patients with pain falls to the primary care clinician, who must be prepared to assess, diagnose, and manage their patients’ pain conditions. Physicians, physician assistants, nurse practitioners, nurses, pharmacists, hospitalists, psychologists, social workers, and other healthcare professionals. View our most recent demographic information to better understand the numerous types of practitioners who attend the national conference. Why is PAINWeek in Las Vegas? Las Vegas offers something for everyone--from exquisite dining to world-class entertainment. Many airlines serve Las Vegas, offering many nonstop flights at reasonable cost. PAINWeek has also negotiated unbeatable rates for luxurious hotel rooms at The Cosmopolitan of Las Vegas, a unique resort located directly on the Las Vegas Strip. PAINWeek has specifically chosen this venue both for its creature comforts and for the conduciveness to learning offered by its conference facilities. Do I need to attend everything on the schedule? PAINWeek offers many different types of programming and sessions, over 120 hours of CE/CME credit. You cannot physically attend every session. PAINWeek envisions that you will plan your personal curriculum to best suit your individual practice and educational needs. If there are sessions being presented concurrently that you would like to attend, don’t fret. PAINWeek will be recording most CE/CME sessions and these will be available after the conference for you to view. Please note that it is highly unlikely that commercially supported PDM sessions and symposia will be recorded. PAINWeek is also offering a “first-timers orientation session” (not for CE/CME credit) on the evening before PAINWeek starts. At PAINWeek 101, you will get an overview and a better understanding of everything PAINWeek has to offer so that you’ll be able to make the best use of your time. You will receive details regarding this session after you have registered. What is a PDM program? A PDM program can be a product theatre, disease awareness program, or medical information program. They are sometimes referred to as promotional programs. These are typically provided by our industry partners to complement the PAINWeek curriculum and give you cutting edge information on the newest therapies and medical devices. PDM programs do not offer CE/CME credit. Satellite events refer to a variety of events that are ancillary to the PAINWeek core curriculum. These may include PDM programs (see above) or satellite symposia that are commercially supported. PDM programs do not offer CE/CME credit. Satellite symposia, or symposia for short, will offer CE/CME credits that are handled separately from PAINWeek credits. You will receive a separate certificate for attending symposia. Can I get an Exhibit Hall Pass? PAINWeek does not offer an Exhibit Hall only registration. To get full access to the Exhibit Hall you must purchase a full conference HCP or non-HCP registration. Can I get a Guest Pass? PAINWeek no longer offers guest passes. All participants at the meeting must purchase a full registration. All Registrations are final. PAINWeek will provide no refunds if you are unable to attend. PAINWeek will be offering registration insurance in the event that you are not able to attend due to health issues or natural disaster. I’m not sure I can get time off from my work/practice to attend PAINWeek. If securing employer support for attendance is a concern, we’ve prepared a section on our website with helpful tips. Look for the Attendee Support section on this page for more information. If you’re in private practice, be assured that PAINWeek is designed to make the best possible use of your valuable time. The schedule makes use of weekend time to minimize your work week time away. Each slot on the agenda offers several course choices, enabling you to fully customize your participation to your own needs. You don’t need to sit through something that does't meet your practice and educational needs. Isn’t pain management mostly about opioids? Our focus at PAINWeek is on multimodal pain therapy, and we offer instruction in many pain management techniques. Opioid therapy is only one of many topics covered at PAINWeek. Will PAINWeek be expensive to attend? PAINWeek is the best value in certified continuing pain education! As the largest US pain conference, we can keep our registration fees low, and you realize even greater savings if you take advantage of our advance registration and group registration discounts. We have negotiated discount rates at our venue that are among the lowest hotel room rates available on the Las Vegas strip. How do I register for PAINWeek? What is the registration price for PAINWeek? Practicing healthcare professional, resident, or students. This information will be verified by PAINWeek staff prior to confirmation of your registration. If you are affiliated with a pharmaceutical company; device manufacturer; medical, healthcare education, or communications company; screening lab; or other PAINWeek sponsor or exhibitor. I registered for PAINWeek, but found out I unfortunately cannot attend. Can I transfer my registration to a colleague? Yes, your registration may be transferred to any other individual at any time for an administrative fee of $25. Please call us at (877) 724-6933. You may also transfer your registration to the next year’s conference. What is the best way to get from the airport to The Cosmopolitan of Las Vegas? The most efficient way to get from Las Vegas McCarran International Airport is via a 15-minute taxi ride. The Cosmopolitan is 5 miles from the airport and will cost approximately $18, not including gratuity. Click here for more information, please click here. I would like to book my stay at The Cosmopolitan of Las Vegas. When does the PAINWeek block rate open? We will list the 2019 rate once the the room block has opened. The PAINWeek room block usually opens in late spring or early summer. The PAINWeek block rate at The Cosmopolitan ($165/night + $30 optional resort fee) is available ONLY after registering for the PAINWeek conference. Complete your registration. Upon registering, you will receive a link to book your hotel room. There will also be a phone number and group code if you prefer to call the hotel to book your room. Registrations made before the room block opens will receive a separate email with instructions on how to book a room with the PAINWeek block rate. Why does The Cosmopolitan of Las Vegas reservation agent have no information about the PAINWeek room rate? We will list the 2019 rate once the the room block has opened. The PAINWeek block rate at The Cosmopolitan ($165/night + $30 optional resort fee) is available ONLY after registering for the PAINWeek conference. Complete your registration. Upon registering, you will receive a link to book your hotel room. There will also be a phone number and group code if you prefer to call the hotel to book your room. Please note: the PAINWeek room block usually opens in late spring or early summer. Registrations made before the room block opens will receive a separate email with instructions on how to book a room with the PAINWeek block rate. Can I extend my stay at the resort, either before or after the conference? We will list the 2019 rate once the the room block has opened. We can offer you the same conference rate of $165 per night (plus the optional $30 resort fee) starting 3 days before the conference and 3 days after. What if I’m not comfortable with walking through a casino? The PAINWeek conference venue is different from others in Las Vegas: you can access the meeting spaces and dining options (even the gym and spa) directly from your room, without going through the casino. * No need to experience “Las Vegas” if you choose not to! Can I modify my room reservation after registering for PAINWeek? Yes, you can reach out to the hotel at any time after booking to change your reservation. You can always cancel with no penalties up to August 1. What’s included in the $30 optional resort fee? Why is there a charge of $187 from The Cosmopolitan on my credit card? The Cosmopolitan charges a deposit amount equal to one night’s stay and tax to your credit card to secure the room reservation. The PAINWeek discount housing rate for standard rooms is $165, plus 13.38% Nevada lodging tax brings the total billed to $187.08. I am interested in taking SuperShuttle from the airport to the Cosmopolitan of Las Vegas. Is there a discount? SuperShuttle is offering PAINWeek registrants 10% off shared or single rides to and from McCarran International Airport to the Cosmopolitan of Las Vegas. Reservations can be booked on www.supershuttle.com, and using group code (CODE COMING SOON! ), or by clicking group.supershuttle.com/group-page/painweek. Can nurse practitioners earn pharmacology contact hours at PAINWeek? Yes, PAINWeek is approved for pharmacology credit. Please refer to the m.painweek.org. After each session name, you will see “AANP Rx Hours” and the number of contact hours it has been approved for, if any. My state requires CME in pain management. Does PAINWeek satisfy these requirements? One-time requirement of 12 CME credits in pain management and treatment of terminally ill and dying patients must be finished before the second license renewal date or within four years, whichever occurs first. Every 5 years, one needs 2 CME hours each in chronic pain management and in end-of-life care. Renewing licensees who prescribe controlled substances are required to obtain 3 credits in pain management training. Two hours of MD ethics is required every two years, for which one may choose to complete 2 hours in medical ethics or substitute with pain management and/or addiction care CME for this requirement. Five pain management credits are required every three years. Any physician operating a pain management clinic must complete at least 20 hours of Category 1 CME in pain medicine every two years. Six credits of pain management or end-of-life care must be completed within 12 months of receiving the initial license. An additional 1 hour pain management provided by the pain management commission of DHS is required. Specialized CME in pain management is required for providers of intractable pain management. Those who practice in pain management clinics must annually acquire 10 pain management credits. Every 2 years, one-hour hospice, palliative care and/or pain management is required. One-time requirement for 3 CME credits in Board-approved pain management prescribing and drug diversion during each renewal cycle. How will I request/receive my CE/CME credit? To receive credit, you must complete the online conference evaluation form and the request for credit form. You will receive an email from PAINWeek shortly after the conference ends with instructions on how to complete the evaluation and request for credit forms. Hint: keep some notes and key thoughts about each session and faculty speaker so you can refer to them later. NOTE: Special procedures apply to pharmacy learners to request and receive credit. Pharmacy learners will not be eligible to receive partial credit. Individual courses must be attended in their entirety in order to be eligible to receive credit for those 1.0 or 2.0 credit hour sessions. In order to receive credit, pharmacist participants must attend an entire course and complete the online credit application and evaluation form. An NABP number and date of birth will be required to complete these forms and earn credit. Please bring this information with you to the conference for use while completing your evaluations. If you still need to create an NABP e-Profile and obtain an ID number, please visit nabp.net/. Notification of successful completion of courses will be communicated by Global Education Group to the ACPE CPE Monitor system, where all pharmacy learners’ credits are stored. Learner errors providing NABP numbers and/or DOB will result in unsuccessful reporting of credits to the CPE Monitor system. These credits will not be recorded. Ensuring records are accurate and complete will be the responsibility of the individual learner. For more information regarding CPE Monitor and issuance of ACPE credit, please click here. Do I receive CE/CME credits for attending a PDM program? No, you will not receive CE/CME credit for attending a PDM program. You may still be requested to complete an evaluation form, but you will not receive a credit certificate. If you are unsure whether a session is certified for credit, please refer to the program book, which you will receive at PAINWeek, or ask a staff member. There will be prominent signage on site indicating sessions not certified for credit. Can physical therapists (PTs) apply for CEUs if they have documentation that they attended courses? Physical therapy (PT) CEU requirements vary by state. Most PT state boards will accept AMA PRA Category 1 Credit™. For a list of all state PT boards, please click here. If you require more information, please contact the Accredited Provider for PAINWeek at inquire@globaleducationgroup.com. We know many of you need to plan far in advance to attend conferences. Here are the dates for future PAINWeek national conferences. View previous PAINWeek Program Guides. Click here to view the PAINWeek 2018 Program Guide. Click here to view the PAINWeek 2017 Program Guide. Click here to view the PAINWeek 2016 Program Guide. Click here to view the PAINWeek 2015 Program Guide. Click here to view the PAINWeek 2014 Program Guide. Click here to view the PAINWeek 2018 Conference Schedule. Workshops are in addition to our regular conference sessions at an additional fee and can only be added in addition to current registrations, not attended as single courses. Cannabis and Cannabinoids: Kissing Cousins or Good Cop/Bad Cop? This fast paced, case based course will take learners on a journey exploring the scientific evidence that supports or refutes the use of cannabinoids, including clinical pharmacology, acute and chronic adverse effects, and the appropriate use of FDA-approved and other cannabinoids. Also to be explored: the interrelationship between cannabis and opioids, the management of long-term consequences of cannabis use, and how practitioners can use our growing evidence base to recommend cannabis products in states where cannabis is approved for medical use. Participants will leave this session with a commonsense approach to this complicated topic—complications being both therapeutic and regulatory! Come learn strategies to enhance your partnership with patients as a pathway to reduce their opioid health risks. This workshop will introduce critical behavioral and medical aspects of an evidence based patient centered approach to voluntary opioid reduction, including transforming the messaging in the clinic environment, using the right approach and language, partnering with patients, setting them up for success with a tapering schedule, and helping patients feel and be in control. Both provider-level and clinic-level strategies will be discussed. This course will be led by faculty who received national funding to implement a patient centered voluntary opioid reduction clinical program. To encourage active participation in behavioral pain management, several tip sheets will be provided, and an audience Q&A is sure to enlighten. Practitioners today are fairly comfortable dealing with traditional opioids such as morphine, oxycodone, hydromorphone, and fentanyl. But what about buprenorphine and methadone? This case based session will provide attending practitioners with hard and fast skills that can be implemented immediately upon return to work! Contemporary issues with monitoring and dosing methadone will be addressed, including risk stratification for candidate selection, the implication of drug interactions, and the nuances of monitoring. Buprenorphine's intriguing pharmacology will be covered, along with dosing guidance for chronic pain. Importantly, participants will learn how to treat acute pain in a patient receiving methadone or buprenorphine as part of an opioid agonist recovery program. Palliative Care Bootcamp: You're in the Army Now! Soldier up! This 2-part all-day program is jam packed with clinical pearls to manage pain and nonpain symptoms associated with advanced illness. Taught by leading experts, you will learn how to conduct a thorough assessment of pain in a verbal and nonverbal patient (with plenty of practice!) and how to use this information to determine the most likely pathogenesis of pain, which drives drug-therapy decision making. Considerable time will be spent exploring difficult-to-control syndromes, including painful wound care and complicated neuropathic/multipathology pain. The use of ketamine, methadone, and lidocaine will be addressed. Importantly, tips and tricks to develop and support informal caregivers in the medication management process will be explored as well. In addition to the comprehensive agenda of 120+ hours of courses, satellite events, PDM programs, and exhibits, be sure to make note of the following special events throughout the conference week. These special events the Welcome Reception, Keynote, Poster Sessions, and more! Special events for PAINWeek 2019 will be announced closer to the conference. Please note that abstracts have not been edited by PAINWeek staff for content, style, or accuracy, and are displayed as input by each submitter. Click here to view the accepted abstracts for PAINWeek 2018. Click here to view the poster presentation schedule. PAINWeek would like to thank our corporate partners for their participation in this year‘s satellite events. PAINWeek values its partnerships with these organizations and is appreciative of the supportive role that members of this community continue to play in our efforts to provide frontline practitioners with quality educational programs. These satellite events are not part of the official 2018 PAINWeek National Conference and are planned solely by the sponsoring organizations/companies. For industry professionals interested in sponsoring a satellite event, please click here. Satellite events complement the PAINWeek curriculum. These events include both certified and noncertified programs. Course descriptions for certified activities, faculty disclosures, and protocol for obtaining CE/CME credit will be provided by individual event organizers. Please contact the organizers for further details. Seating is strictly limited for all events. Preference may be given to preregistrants. If you are registered, please still plan on arriving at the door no later than 10 minutes prior to start time to ensure that your seat is held for you. A limited number of meals or refreshments will be served where indicated. Nonmedical professionals or members of industry may only be allowed to participate at the discretion of the program organizers. Typically organizers do not accommodate family members, office staff, or guests of healthcare professionals. There are no fees to attend any of these educational activities. Information provided and opinions expressed have not involved any verification of the findings, conclusions, and opinions by PAINWeek. Opinions expressed by speakers do not necessarily reflect those of PAINWeek. No responsibility is assumed by PAINWeek for any injury and/or damage to persons or property as a matter of products liability, negligence or otherwise, or from any use or operation of any methods, products, instruction, or ideas contained in the material herein. Because of the rapid advances in the medical sciences, PAINWeek recommends that independent verification of diagnoses and medication dosages should be made by each healthcare professional. Sponsored by Collegium Pharmaceutical, Inc. This activity is not certified for credit. With a substantial number of patients suffering from chronic pain, Collegium is committed to developing and commercializing products that help address the problems associated with non-medical use, abuse and misuse of prescription products by leveraging the Company's proprietary DETERx® technology platform. DETERx technology can be used with drugs that are commonly abused such as opioids and amphetamines, as well as drugs that have a narrow therapeutic index that would benefit from protection against misuse such as breaking, crushing, grinding, or dissolving the product. This program will discuss key issues around opioid abuse, misuse, and diversion. An overview of opioid formulations with abuse-deterrent properties will be provided before featuring a profile of the technology that makes up the DETERx microsphere delivery system. DETERx is a registered trademark of Collegium Pharmaceutical, Inc.
Jointly sponsored by Global Education Group and Rockpointe. This educational activity is supported by an independent educational grant from the Extended-Release/Long-Acting Opioid Analgesic REMS Program Companies. Please see http://ce.er-laopioidrems.com. This activity is certified for credit. Pain is a significant public health problem, affecting more than 100 million adults in the US. The use of narcotic medications for pain management has increased dramatically in the US over the past two decades. However, pain patients are often undertreated due to a variety of physician- and patient-related concerns and barriers. Despite the pain-relieving properties of opioid medications, the potential for misuse, abuse, addiction, and overdose causes many providers apprehension in prescribing, The Food and Drug Administration (FDA) developed the Risk Evaluation and Mitigation Strategy (REMS) to ensure that the benefits outweigh the risks for the use of long-acting and extended-release opioid analgesics. Extended-Release and Long-Acting Opioid Analgesics: Risk Evaluation and Mitigation Strategy (REMS), incorporates the REMS blueprint into education that is designed to induce changes in knowledge, competence, and performance that will translate into improved quality of patient care and reduced pain for patients. Policymakers under pressure to pass legislation to address the continuing opioid crisis, and overzealous prosecutors seeking to crack down on inappropriate opioid prescribing sometimes overlook the needs of patients with legitimate pain conditions. In this rapidly changing landscape, it is important that pain practitioners are aware of recent trends in state legislation. By understanding what rules apply to their practice, they can be diligent in their practice of prescribing opioids and other controlled substances, thereby safeguarding appropriate patient access. Adopting such practices will also help to protect their patients from harm, and to shield themselves from criminal, civil, or administrative liability. Sponsored by Amgen / Novartis. This product theater will provide an overview of a newly approved preventive treatment for migraine in adults. The program includes a conversation about the approved indication, important safety information, key findings from clinical trials, and other important prescribing information. My Patient's Not an Addict: Why Should I Worry About Opioid Overdose? As opioid overdose deaths have continued to increase annually, it's time to look to our patients with chronic pain who need opioid therapy to be able to do their normal activities of daily living. There are many facets to responsible opioid prescribing. During this program, the faculty will provide guidance on how to identify patients at risk of an opioid overdose. In addition, the faculty will offer their best practices for educating patients and care partners and creating an opioid overdose plan. Identify patients at risk for an opioid overdose. Initiate the conversation with patients and care partners around opioid overdose. Implement a strategy to create an opioid overdose plan that includes education. The purpose of this session is to provide Healthcare Providers with information on the management and treatment of postherpetic neuralgia (PHN) in adults. Key areas related to PHN: Complications of Herpes Zoster will be presented. The program objective is to gain in-depth knowledge of MOVANTIK, the first once-daily, oral therapy in its class specifically designed for the treatment of OIC in adult patients with chronic non-cancer pain. Sponsored by Daiichi Sankyo, Inc. Please join us for an interactive presentation sponsored by Daiichi Sankyo, Inc. Sponsored by SCILEX Pharmaceuticals Inc. In an era of opioid scrutiny where clinicians are urged to consider alternative first-line therapies and prescribe lower opioid doses, approaches to manage neuropathic pain should take into consideration all appropriate options. Topical analgesics have an important place as first-line agents. Limited systemic absorption may result in fewer adverse effects and drug-drug interactions, and titration to an effective dose is not required, making them easy to use. SCILEX Pharmaceuticals invites you to this PDM program that will feature a dialogue between the expert faculty. They will examine clinical data and guidelines around the treatment of neuropathic pain, utilize case studies to share best practices when managing postherpetic neuralgia, and introduce a new, advanced topical analgesic patch that has been formulated to provide superior adhesion and resulting effective drug delivery. Describe the advantages of utilizing topical analgesics to help manage neuropathic pain. Provide a rational approach to the treatment of postherpetic neuralgia that is individualized, maximizes efficacy, and helps to limit adverse effects. Describe the physical attributes, pharmacologic properties, and place in therapy of a new, advanced topical analgesic patch.